If you’re a golfer who dreams of the phrase “island paradise,” consider playing golf on Vancouver Island in BC, Canada. A Vancouver Island golf vacation includes not just some great golf courses, but spectacular scenery, rugged mountains, ocean views, and a moderate climate blessed by ocean breezes. In the summer, a day out on the golf course can last until nearly 10 p.m., offering golfers the convenience of both early or late tee times. In 2010, nearby Vancouver and Whistler will host the Winter Olympics, which is the warmest city ever to stage the Winter Games. Accommodations on Vancouver Island range from small seaside cottages to large luxury hotels (such as the Fairmont), many of which offer some great activity and dining packages. Golf in Victoria, the island’s southernmost city, offers plenty of beauty and challenging courses. Olympic View Golf Club, on the southern tip of the island, provides enough mountains, waterfalls and nearby wildlife to provide plenty of distraction (but please keep your eye on the ball). Also nearby is the Bear Mountain Golf & Country Club, which is a golf course designed by Jack and Steve Nicklaus. Driving up north toward Duncan, you’ll find Arbutus Ridge Golf Club in Cobble Hill. The Golf Club is carved out of forest land near the water. Like most courses on the southern part of Vancouver Island, it stays open year-round. This is a gorgeous golf course and a location you don’t want to miss. Also around Duncan, further scenic and challenging golf can be found at the Cowichan Golf & Country Club, Duncan Meadows Golf & Country Club, and The Cliffs Over Maple Bay, a course and residential community in the Cowichan Valley. 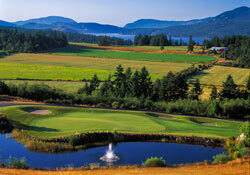 North of the ferry center of Nanaimo, in Nanoose Bay, is Fairwinds Golf Club, the 1999 BCPGA Facility of the Year. Fairwinds is a Les Furber designed golf course that challenges all levels of golfers with its manicured fairways, over 70 sand bunkers, towering trees, and memorable ocean views. Just to the northeast, in Quailcum Beach, is Pheasant Glen Golf Resort, a course dating back to the 1900s, with Mount Arrowsmith in the background. Nearby, in Parksville, is Morningstar Golf Club, which has played host to national championship events. Further up north on Route 19 is Crown Isle Golf Resort, in Courtenay, at the feet of Comox Glacier and the Beaufort Mountains. If it gets too chilly to golf, skiing is only 40 minutes away. Finally, up in Campbell River, Storey Creek Golf Club offers the opportunity to play among the wildlife. Eagles, deer and black bears may be looking on, and the course’s rivers are filled with salmon making their way out to sea. A Vancouver Island golf vacation offers plenty of opportunity to play your favorite game in beautiful and challenging surroundings. Look no farther than B.C., Canada’s mountains, sea, nature, and variety of lodging and dining options to experience your next island paradise. View our Directory of Vancouver Island Golf Courses and Book a Tee Time today!